Overcome by the loss of family and loss of hope in the middle of the Great Depression, 13-year-old Sven Johnson caught a freight-car in Minnesota to head west. Via the Great Northern train and the hobo jungles along the line, he expanded his education and his chance for opportunity. In Montana, he was thrown off by the railroad "bulls" and toward a fresh start in a new family, community and school. Applying his talents and tenacity, he grew in character and capabilities toward remarkable associations and accomplishments. 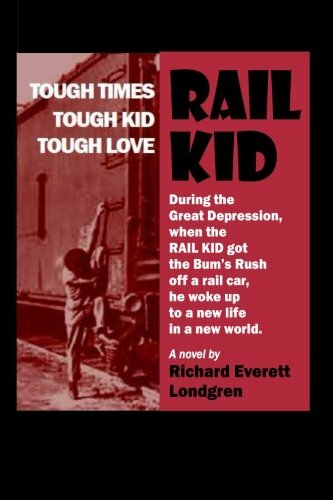 Richard Everett Londgren was born at the start of the Great Depression. His family lived near the railroad tracks and saw many hoboes riding the Great Northern rails. Though times were tough for his family and many others, he enjoyed life in his small community and caring family. He helped milk the family's cows, rescue eggs from hens and do his duty in the family garden. Along the way, sports and other school and town activities enriched the humble Great Depression life. Now, those experiences have helped him record that kind of life in his novels.